Summary: Viruses can coat themselves in silica glass to protect themselves, like donning a suit of armor. This finding has implications for the search for life on other planets such as Mars. What's a virus to do when it finds itself in an inhospitable environment such as hot water? Coating itself in glass seems to not only provide protection, but may also make it easier to jump to a more favorable location to spread. Whether microbes were in the supposed Martian water is still up for debate. One problem is scientists don't even know how to look for viruses in the fossil record on Earth, said researcher Kenneth Stedman, an associate biology professor at Portland who supervised the new virus research. One of his graduate students, James Laidler, led the work. "I'm convinced there are viruses in the rock record, but we don't have the technology to detect them," Stedman said. "We really need to develop the technology [for virus detection] here before we can even think about going to look there [on Mars]. We're trying to do just that." Stedman's lab is in the early stages of looking at virus "biomarkers", or a naturally occurring characteristic that can give clues about its origins. The challenge is, viruses use cells to replicate, so to find a virus biomarker one would need to figure out the difference between the two. If they could find the virus biomarkers in rocks, this could be a leftover of a past virus. Stedman is now working on a manuscript that examines this topic. It's possible that when viruses are coated in silica that they can become part of the rock record. First, however, the researchers are looking at how the coating mechanism works. Previous work in Stedman's lab showed that model viruses could be silica-coated in conditions similar to hot springs. Stedman's most recent research, published online in the Journal of Virology, probed what happens to different virus types if and when they take on a silica sheen. Team members placed each of these viruses in an environment similar to that of a hot spring, which is damp, oftentimes acidic and features water at or close to boiling. All but the bacteriophage PRD1 developed the silica coating; "It just shrugged off the silica and said, who cares," Stedman said. "We have no idea why PRD1 is resistant to silica coating, but probably there is something special about the structure." Silica makes the viruses less effective at infecting because of the glass barrier surrounding them. The E.coli virus, Bacteriophage T4 was rapidly inactivated, but the hot spring virus saw a moderate slowdown, while the smallpox virus was "incredibly" susceptible, Stedman said. "That's not terribly surprising," he added. 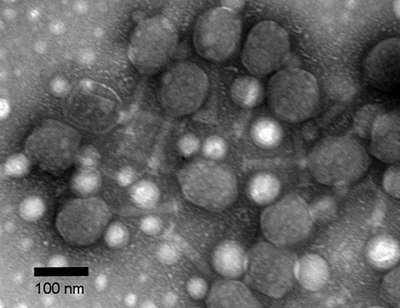 "The surface of the Vaccinia virus looks a lot like a bacterium in terms of having a membrane around the outside. Looking at bacterial mineralization that you find in hot springs, etc. [it's clear] why Vaccinia gets coated really well." "At least 90% of the activity comes back, and so basically you can coat the viruses in silica, mistreat them, and then you can uncoat them. We call this the zombie experiment. We can inactivate them, and then they come back." What's more, once the viruses are encased in silica, they are extremely resistant to desiccation, or drying. It's possible that the viruses they can survive deep freezes and other harsh environments, but drying is the only environment change tested at Portland so far. 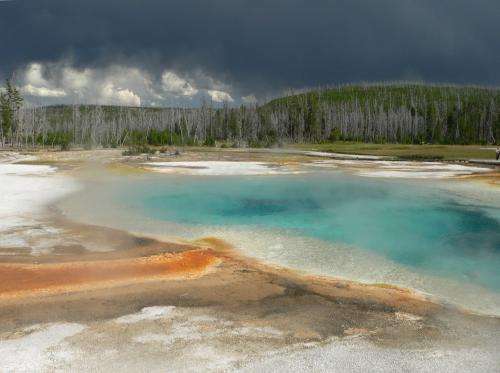 "The reason we tested desiccation is there are some rather strange data, particularly in hot spring viruses, that seem to indicate that these hot spring viruses are getting from one hot spring to another relatively quickly on a geologic time scale," Stedman explained. In tested conditions similar to that high in Earth's atmosphere – which has a temperature and pressure similar to that of the frosty Martian surface – Stedman's team found that the viruses can get their mojo back as long as they are out there for less than a month. Any longer and their activity ceases, for reasons Stedman's team is still puzzling out. "One of the issues with any astrobiology implications is 'could something be transported from a meteorite, from one planet to another?' In the conditions we looked at, No. There is a loss of that activity." "10% to 40% of vaccines spoil and have to be thrown away," Stedman said, adding that the Bill & Melinda Gates Foundation has poured money into transportable refrigerators to get these vital shipments into the developing world. But Stedman hears of examples in the United States, as well: "One of my colleagues, his wife is a pharmacist. Their fridge died and they had to throw out the flu vaccine." Major funding for this research came from the NASA Astrobiology Institute Director's Discretionary Fund as well as the National Science Foundation. Stedman's results will be printed in the Journal of Virology on Dec. 15. Could a newly discovered viral genome change what we thought we knew about virus evolution?